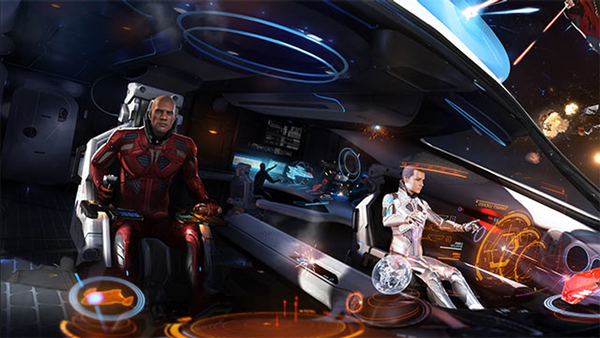 With Elite Dangerous: Horizons 2.2 The Guardians mostly behind us, I thought it was time to peer ahead at one of the most anticipated features promised for 2.3 The Commanders: Multi-Crew. Now, there has been a lot of discussion on the official forums and Reddit, since the feature was first announced over a year ago. Most of this discussion has centered around how multi-crew will affect PvP for solo players. I’m not going to address possible game balance issues because mostly I fall into the camp that thinks that, since multi-crew will use the current Wing system, it’s no different than a wing of four players. No, I want to discuss the possible mechanical issues around how multi-crew might be implemented and make some suggestions for how I think it could work. I’m going on the assumption that Frontier Developments won’t choose to implement some “teleporting” method for boarding a wingmate’s ship, as ObsidiantAnt suggested in his video a few months back. Given how FDev has tried to maintain a certain level of realism, I’m going to assume that in order to board a wingmate’s ship, you’ll have to both be docked at the same station. With that assumption, though, come some interesting problems to solve. The biggest problems to contend with are likely technical ones. We have had our ups and downs with instancing since the game’s official launch, and one would assume FDev would do their best to get all that smoothed out before 2.3 launches. Still, disconnects, logouts, and instancing issues are going to happen, so how is this going to be dealt with programmatically? If a ship owner suddenly loses connection, via disconnect or logout, or gets dropped from the instance, will their wingmates be stuck aboard the ship until they reconnect or rejoin the instance, or will they get dumped into space? Will all wingmates have access to the con by default, or will that require ship owner permission? If the ship owner doesn’t return, for whatever reason, will the remaining wingmates have the option to eject, and if they do, where will they end up? If any wingmate disconnects or gets dropped from the instance will they still be aboard the ship when they return? What happens to the wing when the ship is destroyed? Obviously, the ship owner gets a rebuy screen, but what of the other three? These are all issues that we, as MMO, players have to contend with in every game we play, and in most cases we have options to boot members of the party or group who have, for whatever reason, become unavailable. Elite Dangerous, though, has the added wrinkles of outer space and ship ownership. Unless FDev plans to introduce commandeering of ships, the ship owner should always be the wing leader, and should therefor have the ability to add or remove players from their wing at will. Also, all wingmates should have the ability to join (if invited) or leave a wing at will, just as they do now. And while I think the ship owner should be able to hand the con to any wingmate, they will always remain the ship owner and be able to take back the con whenever they desire. That solves the ship ownership wrinkle but, unless the ship is still docked, the wrinkle of booting a wingmate in the black or at a port other than the port of origin is still an issue. And I haven’t even touched on the issue of griefers. I’m talking about ship owners refusing to return to the port of origin to disembark their wingmates, or wingmates refusing to leave a vessel, because, let’s face it, there are those who would do such things for the LOLs. Obviously most of these issues can be resolved with slight modifications to the rebuy screen. If you’re the ship owner, well, you’re not going to have to worry about any of it unless the ship has been destroyed, in which case you’ll get the standard rebuy screen. If you’re a wingmate, though, you could just be given a screen that, upon confirmation, returns you to the port of origin. It’s not elegant, but that’s the easy solution. It is a solution, though, that I think eliminates a potential gameplay opportunity. I’m talking about the ability to transport players between ports with shipyards. Provided every wingmate has access to Starport Services at any port the ship owner docks with, each wingmate could have the option to buy a ship, if they don’t already have one docked at said station, and leave the wing at any station with a Shipyard the ship owner docks with. 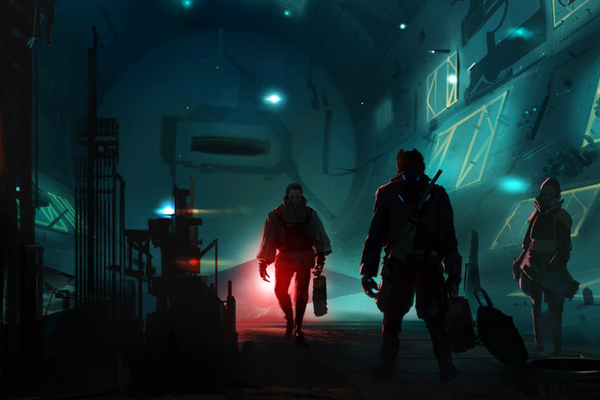 In the case of leaving or being ejected from a ship in the black, the player could be given the option of returning to the port of origin or the nearest station with a Shipyard. And this could all still work with only slight modifications to existing UIs. This pretty much solves all the mechanical issues that might crop up with multi-crew, and adds some game play. With things working like this we could have individuals or even player groups offering to shuttle people around The Bubble, or even out to Colonia! With some extra work on FDev’s part, though, I think this can be taken a step further and even give us a small, teasing taste of space legs. As the game stands now, if you leave your ship and board a ship launched fighter, you get a fade out from the helm of your mothership, and a fade in on the helm of the fighter. This makes sense because you’re flying the fighter by wire. If you leave your ship and board an SRV, you get a fade out from the helm of your mothership as your pilot slowly rises out of the chair, then a fade in inside the SRV bay as the SRV is being lowered to the planetary surface; this isn’t ideal, but we can’t walk around our ships yet, so it’s a decent compromise. We also have a Crew Lounge interface in Starport Services. It’s with the Crew Lounge that the whole process of boarding and disembarking each other’s ships could be made interesting. Let me set the scene. You’ve just docked at a station hoping to find passage out to Colonia. You’ve heard some cool stuff is happening out there, but you just can’t make it yourself in your Sidewinder. You click on the Crew Lounge option in Starport Services and, in addition to the current interface for hiring NPC Crew, you get a button to Enter Crew Lounge. You click it and get the same slow rising, fade to black animation as when you board an SRV. This time, as it fades in, you’re greeted with elevator doors and the sound of elevator machinery running. The doors open on a Crew Lounge themed to whatever type of station you’re docked in (military, scientific, agricultural, high tech, refinery, etc.) and inside are other commander’s avatars. In this new Crew Lounge you could then interact with the avatars, everyone spent so much time crafting, in a way other than just seeing them sitting in a flight chair on a bridge. You could chat and wing up with someone headed out to Colonia. Maybe there’s some chairs, or couches to sit on, or a few NPC vendors to interact with. There could even be some VR rigs to run the newly updated tutorials in. There would also be an NPC or holographic interface to interact with the station’s Shipyard. Whatever is in there, it gives us a small arena to walk around, chat, and emote in. Once you’re ready to leave, you enter the elevator and take the same fade out/in animation back to your ship or the ship headed to Colonia. If things go bad on the trip, and you’re ejected or have to eject, you get an ejection animation (finally) and a fade out/in to the inside of an escape pod with muffled breathing sounds (similar to when your canopy breaks). In front of you is an interface where you can choose to spawn back at your Crew Lounge of origin or one in the nearest port. If everything goes smoothly and you arrive in Colonia, you could disembark into the Crew Lounge there. Either way, you could chat with any commanders there to try to find another ride, interact with the Shipyard and either board your Sidewinder (if you spawned back at your port of origin), sell your Sidewinder back at the port of origin and buy a new one, or transfer any other ship you own, to Colonia or whatever station you ended up in, hanging out in the Lounge while it makes the journey. The Crew Lounge also has the added benefit, from a development standpoint, of being an incremental step toward space legs; it would be a great place to test the basics without any game breaking impact. And all of this maintains the realism that simply being able to “teleport” to a friend’s ship would completely shatter while adding some new game play involving shuttling other players around (Tenten’s Hauler Taxi Service – We’ll get you there … somehow). I know, we can’t yet trade with other commanders, so such shuttling services would be pro bono, but this hasn’t stopped groups like the Fuel Rats and the Iridium Wing from doing their thing. Also, it would go a long way toward boosting the player population at Colonia and any other bubbles that spring up. Additionally, it is in keeping with the recently added passenger missions. So, over all, I think it’s a win-win for players and FDev. Does it require more work than simply popping people into each other’s ships and back? Yup. But, I don’t think it’s a great deal more, and the benefits we gain are worth it when you consider that the work is all an incremental step toward space legs. I would really like to know everyone’s thoughts on this aspect of multi-crew. Again, I’m not really interested in discussing any combat balancing issues multi-crew presents; that’s a soundly beat horse. But, I am really interested in thoughts, and any other potential problems and solutions, with regard to the game mechanics of boarding and disembarking each other’s ships. I like these ideas! Though your solution instantly reminded me of Earth and Beyond, with their small commerce areas at each station that you could walk around. Walking around seems to be one of the complicated parts. If they’re not ready to implement this, or are working on it, or have it slated for later, I could totally see them setting up at least part of your suggestion: you disembark your ship with the stand and fade camera, then fade and sit at, say, a console in the station. Basically you end up “outside your ship”, but now have access to the same station services, but also a communications channel — dedicated chat, basically, front and center instead of up in the corner. You would be communicating with people in the station (green), or people in the system (yellow). Talking beyond that would require you to get back in the ship and head out. If they can book passage on someone else’s ship, then they stand and fade, and fade and sit in someone else’s ship.